Last week there was a special on chicken at my local A&P. .99 cents a pound for thighs, legs and breasts. Of course I ran over and stocked up, who wouldn't, right? Bought some family sized chicken thighs and a couple of packages of the chicken breasts, they were half-breasts, huge. Had them in the freezer but today while trying to decide what to make for dinner.... we decided it was chicken day since we rotate proteins and so the chicken breasts made their break-out from the old freeze chest. Being half breasts means that they had the rib cage attached, the skin and were quite large. We thought making breaded chicken cutlets or "Milanesa de Pollo" would be nice since we all enjoy it so there was some work to do before this could be done. First, I removed all the skin, saving it for another time when it will be fried (yes, indeedy!) turning into "Chicharrones de Pollo" (kind of like pork rinds...) to have with a killer sauce in some fresh tortillas for amazing tacos. Mmmmm..... After that I began the task of de-boning the breasts, removing all the bones to leave the tender meat in large, whole pieces. I separated the "tenders" from the main breast section and when I finished, removing fat, sinew, cartilage, etc. there was a pan with all the meat, another with the bones with some meat attached, and another with meat pieces that were taken off the bone. The main meat pan was covered and refrigerated for use later, for dinner. I then took the carcasses and the little pieces of meat and threw them into a soup pot, added some aromatics (thyme, bay leaf and the leaves from the celery I had), filled it up with water and put it over med-high heat so it would turn, by the magic of time, into a rich stock. Since this would take about 45 minutes, I decided to do my mise-en-place (get everything in order) and took out an onion, 2 garlic cloves, celery, some carrots and the flour. Everything got cut into same sized pieces, medium dice, and set aside. I had decided to make good use of the "other stuff" and make a rich, Cream of Chicken Soup. YUM! If you're using cooked chicken that you have on hand, you're good. If you're using raw chicken, put some oil in a pan and over med-high heat, cook the chicken and then set it aside until you need it. Melt the butter (oil) in a large soup pot over medium heat. Add the onion, celery, and carrots and cook, covered, stirring occasionally, until soft, about 12 minutes. Add the flour and cook, stirring with a wooden spoon, for 2 minutes more. Pour in the broth and bring to a boil while whisking constantly. Tie the parsley sprigs, thyme, and bay leaf together with a piece of kitchen twine and add to the soup. Lower the heat and simmer for 15 minutes. Stir in the chicken and bring to a boil. Remove from the heat. Whisk the heavy cream, sherry, and salt into the soup and season with pepper to taste. Remove and discard the herb bundle. 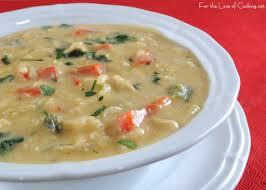 Divide among soup bowls, sprinkle the top of each soup with the chopped parsley and serve immediately. Don't have to tell you that we had a lovely lunch with our soup. It was yummy, just perfect. You can take this basic recipe which is very old and I keep as a guide, and apply it to other vegetables or proteins and have a great soup anytime. Works with leftovers or stuff you have laying around in the fridge which no one wants to eat anymore (you know what that is, right?)..... It may sound a bit involved but let me tell you that it's pretty straight forward and simple procedure. A basic technique. 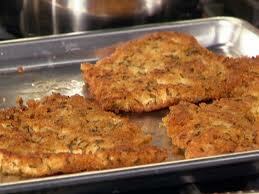 For dinner we're having the Chicken Cutlets, breaded with some Panko (flour, salt & pepper and a little paprika). Oven baked so not much of a mess. You just put some oil on a baking sheet and put it in a 425 F oven to get hot. The chicken should be breaded before and allowed to rest for at least 15 minutes. (this guarantees that the breading won't fall off, really). Then you put the cutlets on the hot oil and bake for about 10 min or until it gets nice and golden. Turn them and bake for another 8-10 minutes. Done. No oil splatter all over the place to clean, no smoke, no nothing. Love it. I also had 2 sweet potatoes, 1 squash, 1 onion, 2 potatoes left over that were looking kind of sad over there so I invited them to dinner. Peeled the lot and cut them up into same sized cubes. Put them in a bowl and tossed the whole thing with some olive oil, salt and pepper, 1 tblsp fresh chopped thyme leaves and put the whole thing on a glass casserole dish and popped it in the oven for about 45 minutes or until it gets golden brown and tender. And there you have a side dish perfect for the Fall. Dinner Done. So if you think about it, one package of chicken became 3 meals: the soup, the tacos and the cutlets. At .99 cents a pound, this is a pretty good deal. We had 6 large servings of soup; 6 chicken cutlets and a large side dish of root vegetables. Not too bad, heh? We had some soup for lunch, saved the rest. Will have half of the cutlets for dinner and have the rest available for sandwiches or lunch on another day, and we have the taco filling ready on yet another day. This is why I don't buy cut-up chicken. Ever. Wow, I stand amazed. Not only is it a wonderful meal, but thrifty. But it's a sin to to chicken skin, or so I am told. oops, too tired to type. Eating chicken skin is forbidden, it's like lard, no one will admit to using it. Imagine all the chicken skin simply discarded because it's too fatty. Sad really. I love chicharones.